NinjaTrader is a free charting and back-testing tool. It is one of the most advance trading platforms currently available, with all the features that any modern platform should have. NinjaTrader charts are extremely flexible, customizable and user-friendly allowing you to visualize market data in a manner that is right for you. Choose from a variety of different chart styles, intervals, and comprehensive visualization with over 100 Customizable technical indicators included. First we have to create yahoo finance connection for that open your Ninjatrader and select Tools option in the main window, a dropdown list will appears, in that select Account Connections. An account connection setup window will appear, in that press Add. Connection option window will appear, press next. In next window add the connection name as Yahoo in the connection name box. Under provider dropdown list select Yahoo and press next all the window and finish the connection setup. Now go File in Ninjatrader main window select Connect > Yahoo. Now Ninjatrader will connect to yahoo finance. Now again go to Tools and select Instrument Manager, an instrument manager window will appear. Under instrument manager list press New and name it as NSE in appeared box. Under Available Master Instruments press New. An instrument editor window appears. Under Master Instrument field type the name of the required symbol as it is NSE, under instrument type dropdown list select stock or index, under currency dropdown list select Indian Rupee and select NSE in the exchanges box. Now ship to Misc tab in the same window, under symbol map select the yahoo and type the yahoo symbol name for the specific stock for example for the stock WIPRO you have to type WIPRO.NS ( Here you can find out the nse symbol names in yahoo) and then press ok.
Added symbol will be highlighted in the available master instrument list and then press left side arrow mark in the window, now the symbol will added to the NSE instrument list. Then press ok to instrument manager window. Now again go to File > New > Chart a data series window will appears now double click the stock WIPRO under NSE. 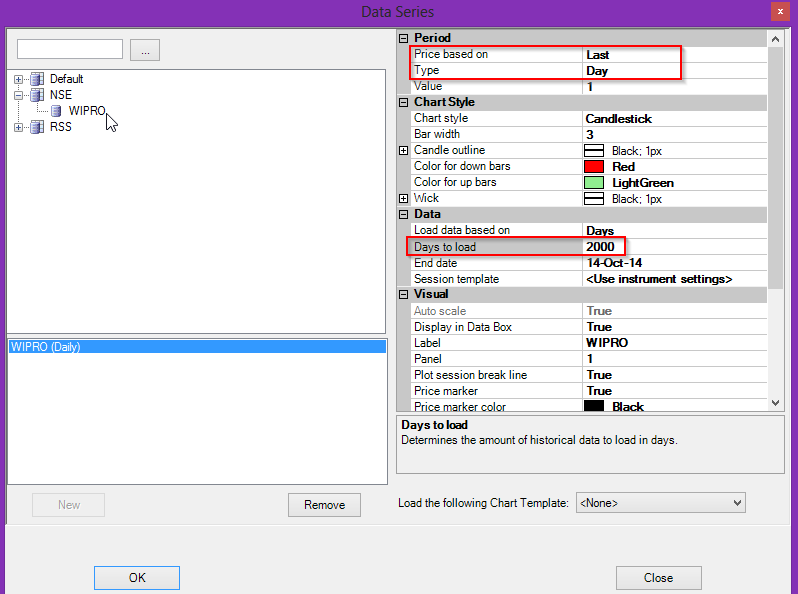 Now on the right side window we have to make some main changes like these (see below image) Price based on = Last, Type = Day and enter the required days in days to load (you may any days as you required) and press ok.
A chart window will open and data will be loaded from yahoo finance,(when data loading from yahoo finance you should be connected to Internet) now you can view the chart of mentioned days. Once data downloaded it will be saved as historical data, next time you need not connect yahoo finance to load the same data. Watch Detailed video on How to Get NSE EOD & Historical Data in Ninjatrader. 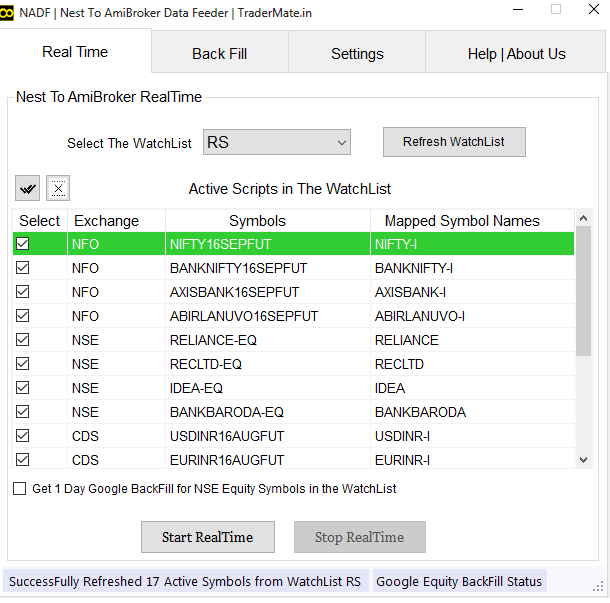 please help to get real time data of NSE .